Hello my friends! I have news, some of you already know if you follow me on Facebook, I am moving to South Dakota in the beautiful Black Hills area in May!! This was a long and big decision for our family and it will take a lot of effort and time to make this happen. 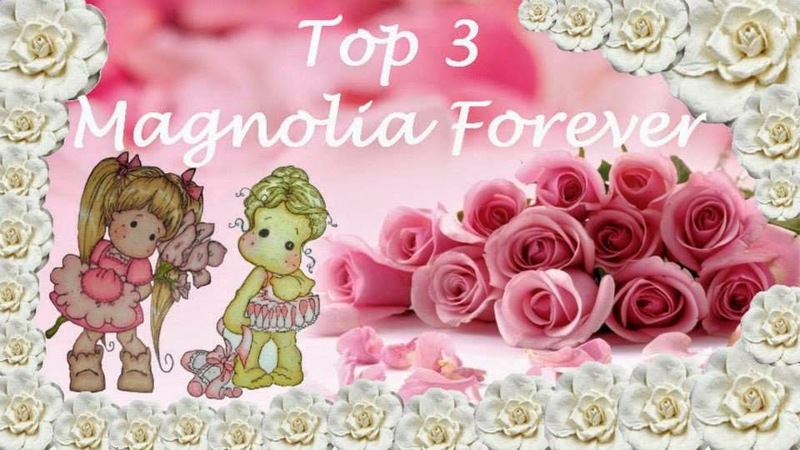 Basically what I am saying is you will see scheduled posts for my DT for the next month or so AND I plan on selling some of my craft supplies, yes I am but I am not quitting my crafting. Our homes that we have in mind all have crafting space for me! Yippee!! Here is a card I made a while ago while I was patiently waiting for new of the sale of our home. My papers are from Maja Vintage Spring and it just took 1 12x12 page to make the card. 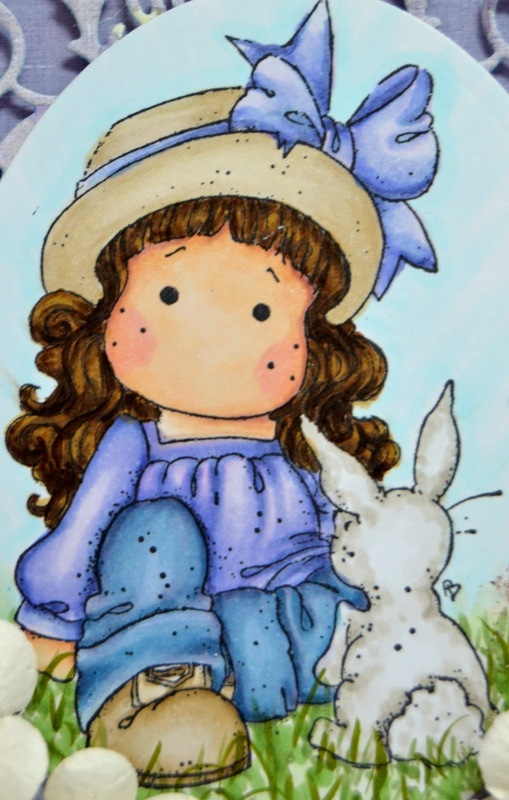 My frame around Tilda and her Bunny is from Joy crafts. 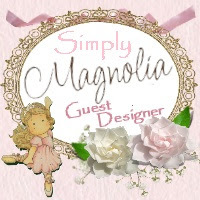 For my tag I used a Magnolia doohickey wrapped heart and a Magnolia doohickey butterfly. 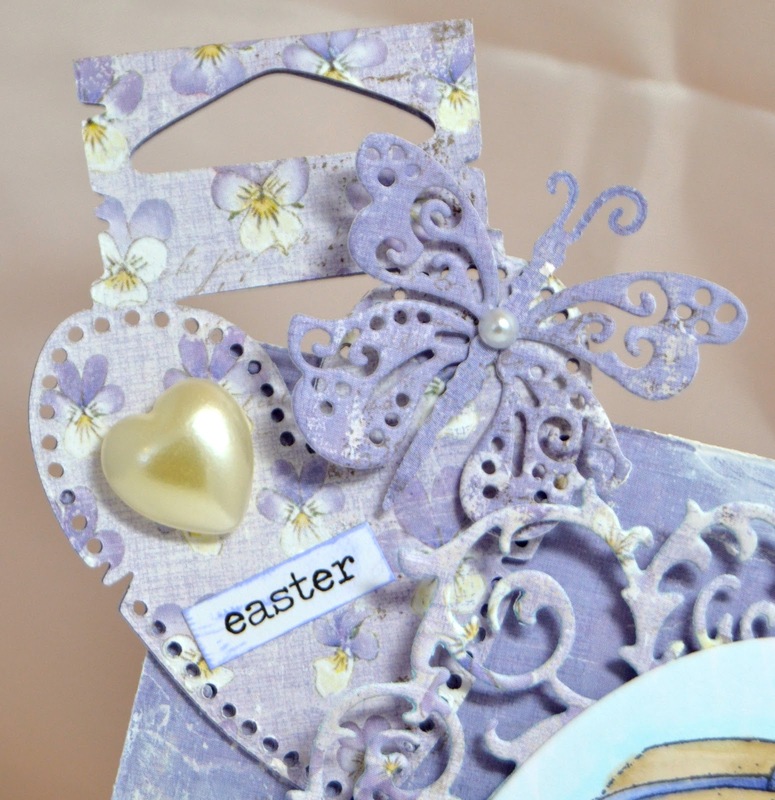 I added a chit chat sticker from Tim Holtz and a heart from Live Love Crafts. Here are some florals I purchased from Live Love Crafts and Magnolia doohickey dies, butterfly and sprawling spruce. I colored Tilda in Copics. 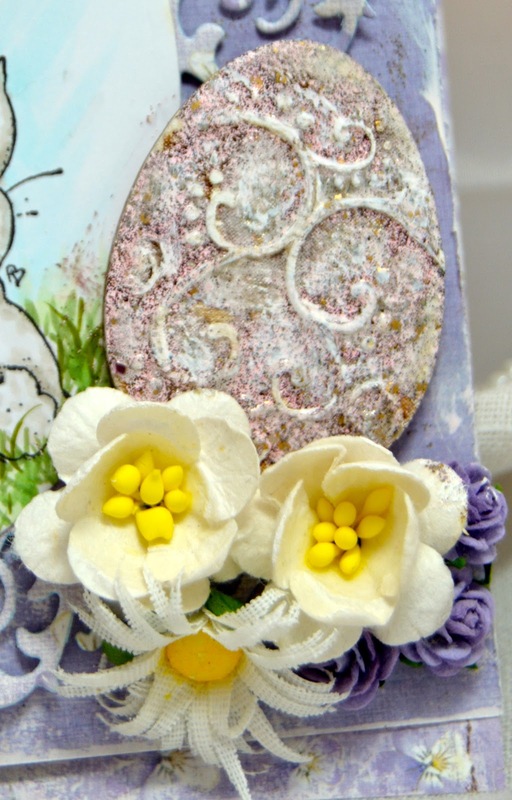 This is a chipboard Easter Egg from Southern Ridge Trading Company, first I frantaged it and then went over the top with some white paint to add more dimension. Thank you for stopping by and I do appreciate your comments. 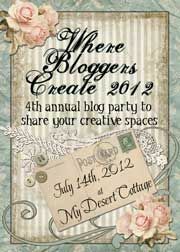 If I get a chance to stop by your blog I will, so forgive me if I cannot. 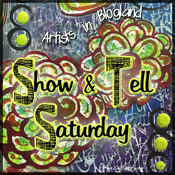 I will add posts for my craft supplies and also update on Facebook whenever possible. Thank you for your understanding and I will be back! This card is so gorgeous Kelly! Love the Maja papers and all of your dies. You put everything together so beautifully. Congrats on the Sale of your home. I know you will have so much to do before May. But it must be exciting to be moving to a new state! Thinking of you! This is so fantastic! The colors are beautiful! Love the texture on the egg! So beautiful Kelly - I really do like blue and yellow together and the yellow in your flowers remind me of the yellows in our eggs - yum! Your coloring is fantastic - are you selling any of your Copics? Gosh May is just around the corner!! Which of the two houses did you choose - the one in the city or the one with the view? 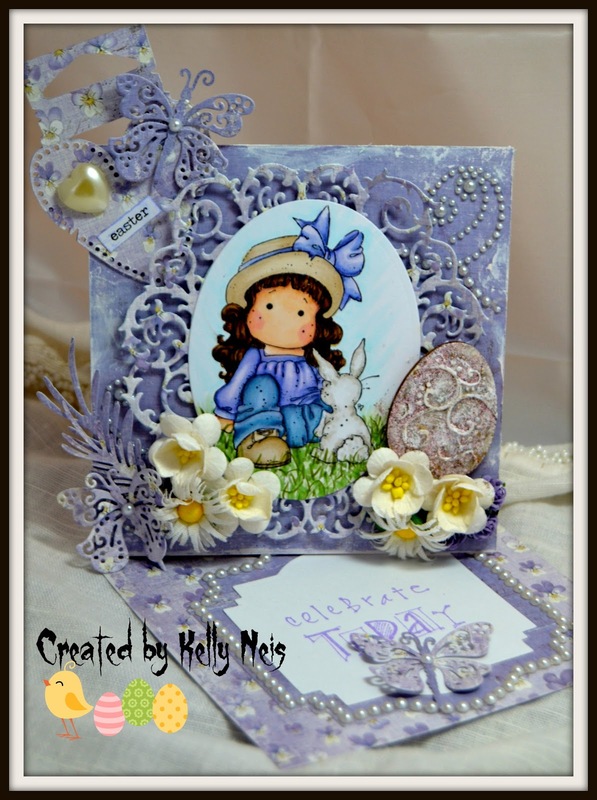 This is such a beautiful Easter card, Kelly! 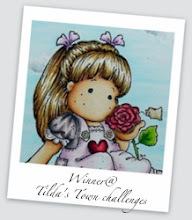 Love the colors, your fabulous coloring of Tilda and all those gorgeous details. Absolutely breathtaking!!! Judging by your post, you have not purchased a house yet...still deciding on the one that will meet your needs. Gosh, you will definitely be a busy gal! 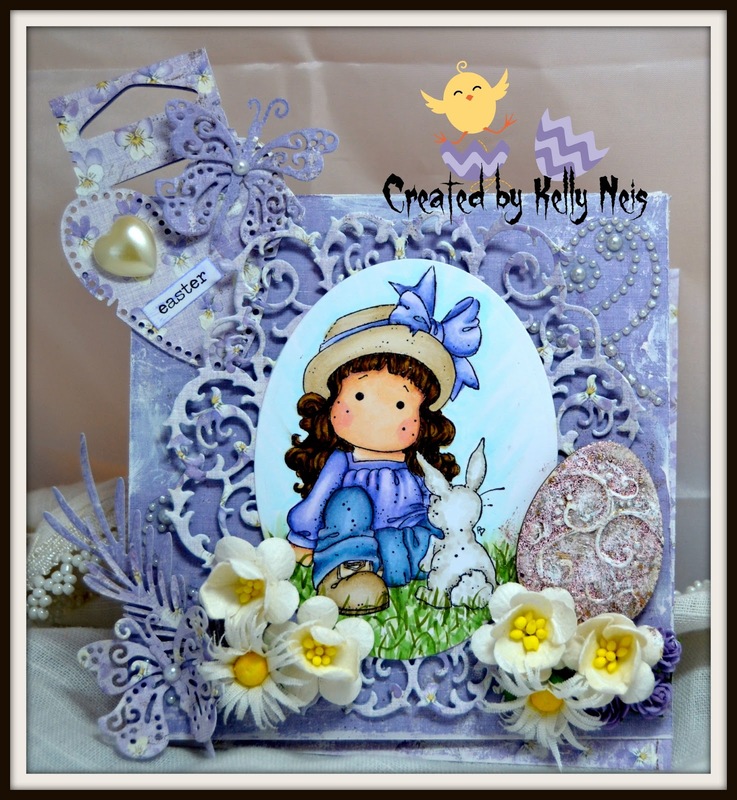 Oh so lovely easter card ! 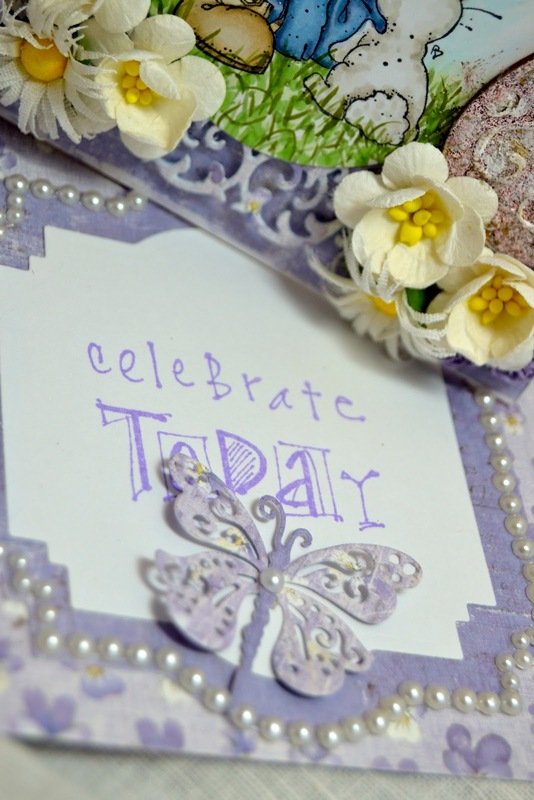 Love the colors and all embellishments ! A beauty ! Your card is stunning! I love that Frantaged egg. Enjoy your day! A great card - and OMG that egg! !